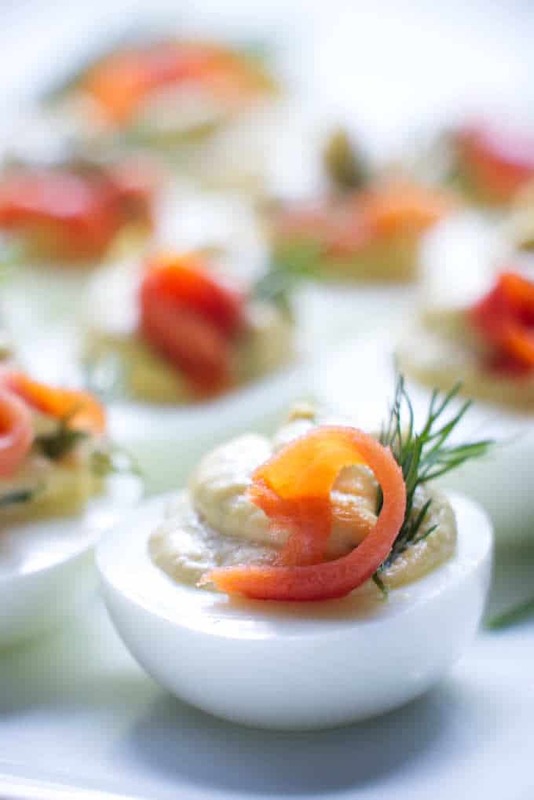 Deviled eggs are easily the first thing to disappear at any party. As a matter of fact I always make more than I think I will need because they seem to disappear before the party even starts. 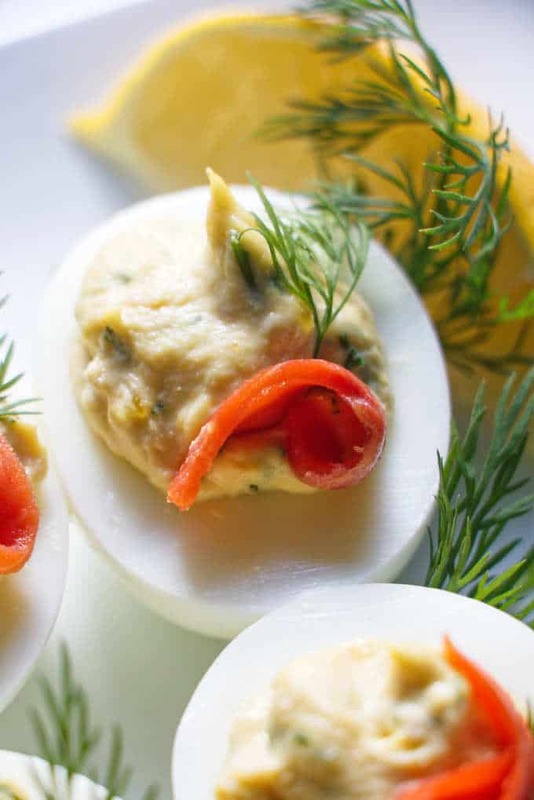 These smoked salmon deviled eggs are no exception. You’re going to love the flavors that the smoked salmon adds to these little nuggets of deliciousness. How long can deviled eggs sit out? According to the Food Safety site, deviled eggs should not sit at room temperature for any longer than 2 hours. Keep them covered in the fridge with plastic wrap or in a sealed container until you are ready to serve them. After you remove the egg yolks to prepare the filling, stick the whites in the fridge to keep them chilled. That way the whites don’t have to sit unnecessarily at room temperature for too long. As we mentioned in our hard-boiled egg post, you can store a hard-boiled egg for up to 1 week. But after you prepare the filling for deviled eggs with all the mayonnaise and other goodies, those little eggs become more perishable. So if you have a bunch of hard-boiled eggs that you want to make deviled eggs with, you can hard-boil the eggs one week in advance. Store them in the fridge (still in their shell) until 1 or 2 days before your party, then make the deviled eggs up to 2 days in advance. Why are deviled eggs called ‘deviled”? Back in the day, when folks called food ‘deviled’ it was because spicy, fiery-hot spices were added to the food. Since the devil always seems to be associated with fire and hot flames (like burning in hell), spicy food was called “deviled”. Over time, the meaning of certain food terms changed and now deviled eggs are no longer associated with the terms of fire and spice. That’s not to say that deviled eggs can’t have some hot, fiery flavors added to them. A ‘true’ deviled egg with hot spices like sriracha, horseradish, or cayenne pepper is super delicious. But you can even add zippy, spicy flavors like spicy mustard which doesn’t make it too hot for l “tender’ palates. Want to make the perfect hard-boiled egg? We have a post that shows you how to make a hard-boiled egg 6 different ways. All 6 methods make pretty good hard boiled eggs but our favorite method is steaming. Ultimately steaming a hard-boiled egg is the fastest method. It takes just as long to steam the egg as it does to boil it the old fashioned way. The thing that saves you time is that you don’t have to wait for a large pot of water to boil. All you have to do is wait a few seconds for an inch of water to boil and then the steam will instantly start cooking the egg. Technically, an ever-so-slightly faster way to hard-boil an egg is to use your Instant Pot. It only takes 3 minutes of actual cook time under high pressure in an instant pot. But that doesn’t include the ‘warm-up’ time and the natural release time. After waiting for the instant pot to warm up and then giving it 5 minutes to sit and ‘do its thing’, an instant pot will take about 11 to 12 minutes to hard-boil an egg. Both of these methods will make hard-boiled eggs that peel super easily. How long does it take to hard-boil an egg? Whether you steam or boil an egg, it will take the same amount of time to get it ‘hard-boiled” We like how easy it is to control the “doneness” of a boiled egg when it is steamed or boiled. It will take 12 to 14 minutes to get the egg “hard-boiled”. We steamed these eggs for 12 minutes which kept the whites tender and the yolks silky smooth. Check out the video in the recipe card to see how we steamed the eggs. If you’re interested in using other methods to cook your eggs then check out our post on hard-boiled eggs. 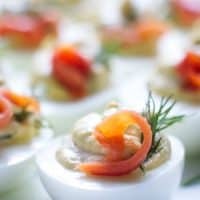 How to make smoked salmon deviled eggs. Deviled eggs are easy to make and these little gems with salty, smokey, cured salmon are no exception. Our printable recipe below has detailed instructions. First, get all your ingredients. The lemon juice and fresh dill make the smoked salmon ‘pop’. You could use dried dill but we really think the flavor is better with fresh. Besides that, if you have some extra fresh dill then it makes an easy garnish. We also saved a few slivers of smoked salmon to decorate the top of the deviled eggs. You don’t need a lot of salt because the smoked salmon is already salty so use your judgment when it comes to the salt. 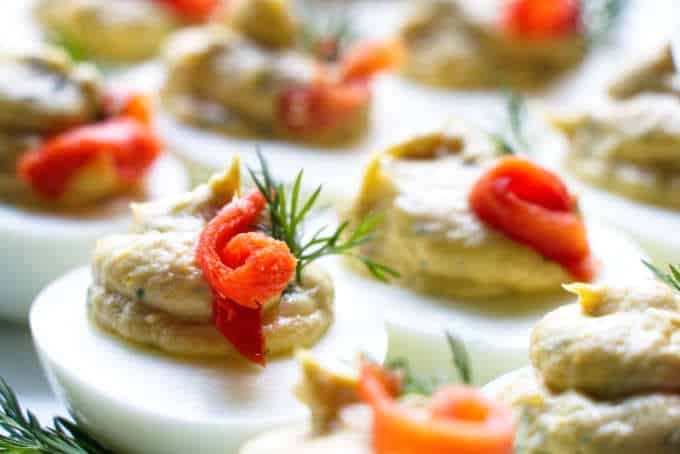 It makes an impressive looking appetizer and I guarantee you won’t have any leftovers. 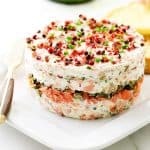 Our smoked salmon spread is a perfect party dip. These smoked salmon Philadelphia rolls are fun and easy to make. Add them to the line-up at your party. If you have any leftover smoked salmon, use it the next morning for some incredible smoked salmon eggs benedict. 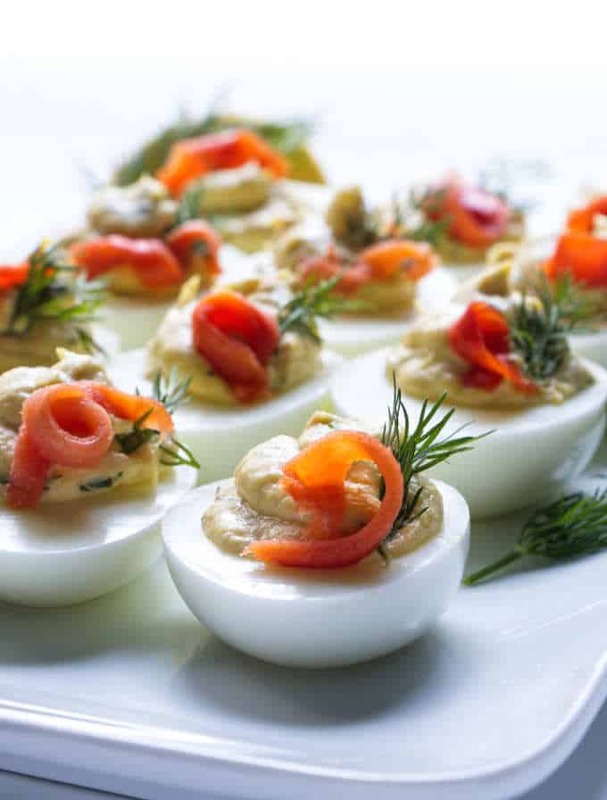 Smoked salmon deviled eggs are a delicious twist on an old classic. 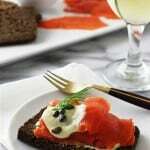 The creamy yolks are blended with smoked salmon, lemon, and dill then topped with a garnish of dill and smoked salmon. Peel the hard boiled eggs and slice them in half. Scoop out the yolks and place them in a bowl. Add the mayonnaise and lemon juice then smash the mixture with a fork until it is smooth. If you want a perfectly smooth mixture then use an electric mixer. Stir in the chopped smoked salmon, dill and salt. Spoon the mixture into the center of the eggs. 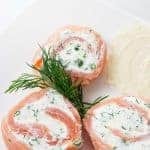 Garnish with extra dill and slivers of smoked salmon. Instead of using a spoon to put the mixture into the egg whites, you could put the mixture in a plastic bag, snip a hole in the corner of the bag and pipe the mixture. You will need to make a hole big enough for the chunks of smoked salmon to get out.